Chocolate for breakfast! Does it get any better? I got this recipe from Sandra's Keeping it Simple blog. The men who attend the weekly Bible study at our house gave it their highest rating: "two bellies up." I made a couple changes reflected here: I used plain yogurt instead of sour cream. I also used regular white flour, while the original recipe called for a combination of white and soft white wheat. Grease a 9" x 13" pan. Put half of dough in pan and smoosh it around to try to cover the bottom. Your layer will be very thin. In small bowl, mix cinnamon and sugar. Sprinkle half of cinnamon sugar over dough, then sprinkle half of chocolate chips. 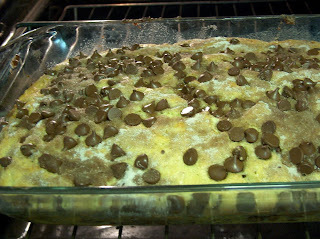 Repeat with layer of dough, layer of cinnamon sugar, and layer of chocolate chips, using all. Bake at 350 degrees for about 30 minutes. Test with toothpick, if desired; it shouldn't be wet and the middle shouldn't be jiggly. NOTE: Check out Tammy's Recipes for more kitchen-y ideas and recipes. It's Kitchen Tip Tuesday. This looks yummy! And who doesn't like chocolate for breakfast? I'm starring this post. Most definitely will be making it. And soon! I'll let you know how it turns out. And I am laughing out loud that my verification word is "diets." My fellows have just made choc chip muffins and waiting for them to come out of the oven. Oh that looks really good! I wonder if it would work to mix it up the night before and pop it into the oven the next morning? I'm always looking for homemade breakfasts that are easy for the Sunday morning rush. 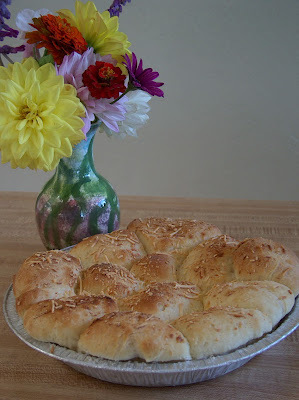 Thanks for visiting my Easter recipes blog and leaving a comment! I think that you have some great recipes, as well. I enjoy your blog and will be stopping by again. What a yummy site! I am sure I have just gained at least 3lbs. just looking! I can't wait to try the mint orange aid! Yum! Thanks for stopping by my site and posting a comment, come back anytime. 50s Housewife, I think that's a great idea, to mix this up the night before and pop it in the oven in the a.m. Good thinking. 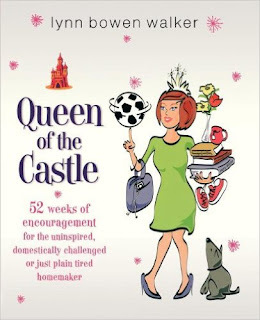 And I am honored that you spent some of your birthday money to buy Queen of the Castle. I'm glad you're loving it :) I love visiting your blog because you have such encouraging posts there. Marcia, Jerri, and Rainy Day Farm, thanks for stopping by. It's so much fun to visit and get great food and Easter ideas from everyone.